Borderlinx | Buy Ebags and ship worldwide with Borderlinx. Cheap rates guaranteed. Ebags USA is the world's largest online retailer of bags and accessories. Founded in 1999 in Colorado, Ebags USA began by selling the products of just seven brands. Today, the #1 online retailer of bags and accessories sells the creations of over five hundred different brands. You can find hundreds of handbags, accessories, backpacks, luggage, laptop bags, and more at Ebags USA. Thanks to Ebags USA's commitment to excellent customer service, shoppers can chat with customer care agents through the Ebags USA website. Ebags USA organizes their products into categories to make it really easy to find what you're looking for. For instance, Ebags USA Handbags are separated by type (crossbody bags, diaper bags, hobos, satchels, etc. ), by color as well as by price. Find the Ebags USA Accessories that will complete your look, from watches to jewelry, sunglasses and hats. Ebags USA has something for everyone: the latest trends for kids, women and men. Ebags USA Backpacks include travel backpacks, school backpacks for kids, laptop backpacks and more. Ebags USA also carries specialized bags for sports, like golf bags, yoga bags or outdoor recreation bags. Ebags USA has something for everyone, whether you're looking for discount or designer bags, a bag for a special purpose or just your new favorite accessory! 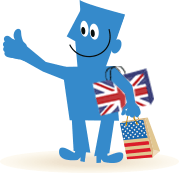 Shop Ebags in the USA and ship to your home country with Borderlinx. You pay cheap international shipping, tax & duties upfront, which you can calculate using our shipping cost calculator. A number of services are available through Borderlinx to make international ordering from Ebags USA hassle-free, including concierge, free repacking and consolidation services.